City of Bones by Cassandra Clare - Clary Fray's life changes forever after going to a nightclub one evening and sees a boy murder another - who's body disappears. Then when her mother disappears, and she finds a monster in her house, Clary is thrown into a world of demons and Shadow Hunters, those who hunt them. Everything she knows is turned upside down, and with the return of the Shadow Hunter's worst enemy, Valentine, and the search to find an ancient relic of great power, the Mortal Cup, before he does, Clary discovers she is more than just an average girl. I've seen reviews for the Mortal Instruments series for a fair while, and thought I would give City of Bones a go even though it didn't really appeal to me. This book has been sitting in my TBR pie for a few months now, and finally made my way to it. And you know what? I so wish I picked this up sooner! As I hand write this review (I'm on holiday, and can't get to a computer right now), I've literally just finished City of Bone and I am BUZZING! There aren't really any words I am capable of using right now to describe how good it is, but the fact that I feel the urge to shout and scream and jump about should give you the idea. City of Bones is that good! Someone pass me City of Ashes now! It may sound odd, but this book reminds me of Doctor Who's tardis in a way; you know how it's bigger on the inside? Well it's kind of opposite with this book. City of Bones is a fair sized book at 442 pages, and the font is fairly small, yet it was such a quick read! And although a lot happens, it looks like I should have at least half the book still to read. My point is, I thought I'd be reading this book for quite a while (I'm not the fastest reader going), and that it may be a little tedious, but it took just two days, and was so exciting. I got through the book much faster than I thought possible for me - while on holiday! The storyline at it's very, very basic isn't all that original; a group of teenagers fighting against an evil adult antagonist, one of said teenagers finding their life isn't what they thought. Sound familiar? Of course it does, you could apply this to any number of YA novels out right now, but this is just the bare bones of the novel. It's the meat of the book that makes this book so fantastic, and stand out from the rest! Like the characters for example. Clary herself is awesome, funny, and strong when she's forced to be, but she is fairly ordinary as a person that any girl could relate to her. The other characters are also amazing! Jace, one of the Shadow Hunters, with his golden angelic good looks, arrogance and humour make him irresistible, even if he is a git at times; Simon, Clary's best friend, the most hilarious nerd I've ever seen read, you just want to give him a big hug; Isabelle, another Shadow Hunter, beautiful and a right cow, and her brother Alec, just as good looking, but not the nicest bloke around. All of these characters and their individual sub-plots intertwine and overlap with the main thread to create a brilliant, and at times beautifully heartbreaking, story. There are so many romantic threads weaving through this book, you're continually switching back and forth over who you're rooting for. The action in City of Bones is incredible, ad it really gets the heart pumping and the adrenalin rushing. Definitely edge-of-your-seat stuff. Simply amazing! This book has jumped right up there with my favourites! Anyone who is umming and ahhing about reading this book like I was, stop hesitating and pick it up now. You won't regret it! I'll leave you with an image that should seal the deal: beautiful, gorgeous Jace, with a cocky smile, sitting astride a flying motorbike. Oh my. Great review! I read a small excerpt of this book online and it gave me a simliar impression....added to my TBR pile pretty quick! I like the mix of characters you mentioned too...it's adds a greater depth to the book sometimes and aids in exploring the main characters personality too. I am absolutely obsessed with The Mortal Instruments series at the mo. Jace is my book crush. Now you have to read City of Ashes. I found you through the International Book Bloggers thing at Persnickety Snark. Gina - Cheers, and I hope you enjoy it! The characters are awesome, you can't help but love them, even if it's love to hate them. Becky - Well, if the other books are anything like the first, I'll love them! So looking forward to reading them! Jace is amazing! Great review! I haven't read the book, but it really sounds great! 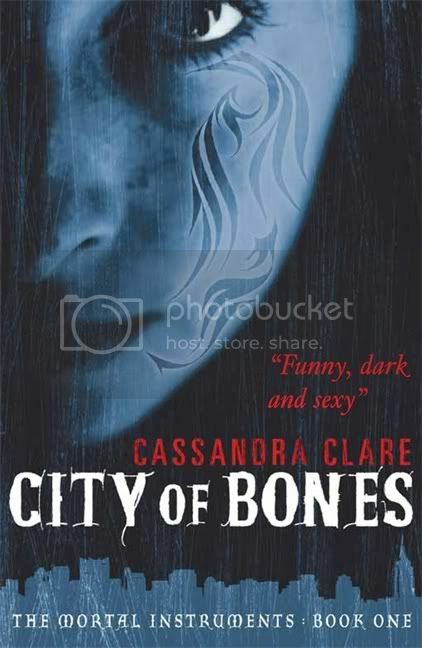 I really loved City of Bones, but if I hadn't read it, your review would definitely have convinced me to check it out! Cheers, Lauren! :) It was so amazing! I digress that my opinion differs greatly from yours. XD But your review was very clear and entertaining. I really enjoyed it. Love your review Jo. I just started this one yesterday and I can't believe I haven't picked it up earlier! So good.